At issue is the illegal roundup of at least 300 horses in the Palomino Valley area northeast of Reno. (February 1, 2019) We have difficult news to report. The U.S. District Court in Nevada has issued a negative ruling in our lawsuit against the Paiute Pyramid Lake Tribe, the Nevada Department of Agriculture and Cattoor Livestock Roundups. At issue is the illegal roundup of at least 300 horses in the Palomino Valley area northeast of Reno. While this ruling is disappointing, it does not change the facts of this case or our commitment to seeking justice for the horses who were swept away and shipped off for slaughter and the residents who were traumatized by the surprise raid that was conducted by members of the Pyramid Lake Paiute Tribe and Cattoor Livestock Roundups on January 4 and 5, 2019. On those mornings, men on motorcycles, ATV and horseback entered the Valley, trespassing over the vehement objections of property owners, chased wild horses off the private lands where they had been living years into traps. They were aided in the rounded by a helicopter piloted by Cattoor Livestock Roundups, which flew dangerously close to the ground over the private lands -- terrorizing the residents and their own animals, including horses and burros. Some of the horses were captured and loaded onto trailers without sorting (mares, stallions, and foals all crammed together) and driven off. Others were stampeded for 15 miles or more into a trap constructed on the border of BLM and Reservation lands. Swept up in the roundup were several privately owned horses and burros, some of whom were later released; others, including Lady, simply disappeared. Missing also are the tiny, newly born foals who were rounded up and likely died in the helicopter stampede. We have learned through our lawsuit that the roundup was a surprise only to the residents, who were never informed of the pending action. The other parties to the action - the Tribe, the Nevada Department of Agriculture, the BLM and the Palomino Valley General Improvement District (whose sole purpose is to maintain the community's roads and which is headed by Larry Johnson, a former member of the BLM National Wild Horse and Burro Board who espoused extreme anti-wild horse views) worked together behind the scenes to pull off the surprise attack. These entities claimed that the horses were owned by the tribe -- despite overwhelming evidence that in fact, they are "feral" horses owned by the State under the law -- in order to avoid state law requiring 4 weeks notice of a pending roundup and public notice of the sale of the horses. The required notice would have given residents the opportunity to buy back some of the horses that called their private property home. Through the lawsuit, we also learned that 271 of the horses were sold directly to notorious kill buyer Dennis Chavez of New Mexico. The NDA cleared these horses for shipment with full knowledge of the dispute regarding the legal status of the horses and the fact that residents were alleging that privately owned horses were taken. The contractor transported the horses to New Mexico despite being directly informed that privately owned horses had been taken up in the operation. When the TRO was issued, and the state provided the brand inspections indicating where the horses were shipped, AWHC mobilized to notify the New Mexico Livestock Board, the sheriff's department in the county where Chavez is located, the Border Patrol, and the USDA office that approves paperwork for shipment of American horses to Mexico for slaughter. We are currently working to ascertain whether the horses have already shipped across the border or whether they may remain somewhere in New Mexico. Make no mistake, we are committed to seeking justice for these horses and for the residents of Palomino Valley who love them. 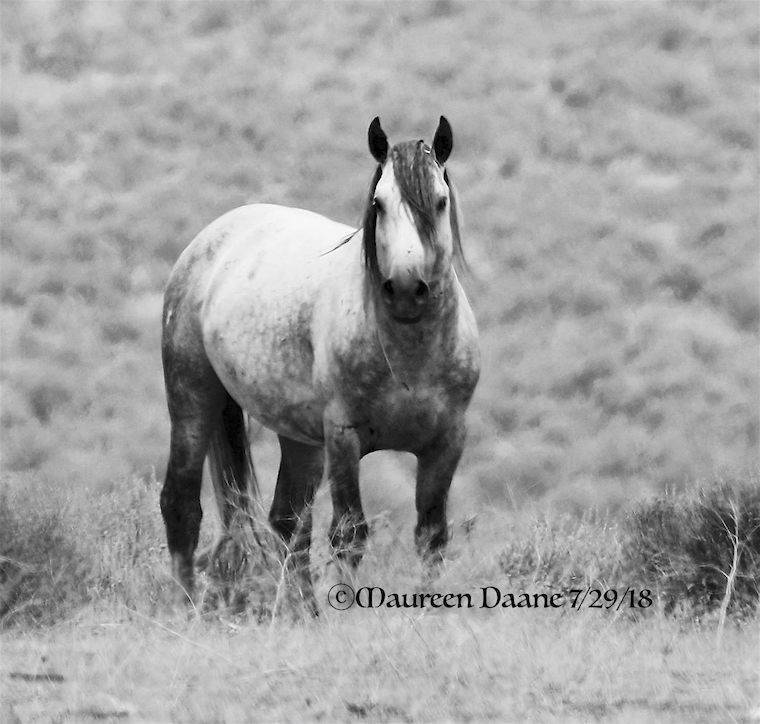 Horses like the grey stallion, admired in Palomino Valley for so many years, who somehow eluded capture but lost his band and wandered back to the land he called home, thin, alone and forlorn. Yesterday, he was found dead. The resident who found him, and knew his family, is convinced that he died of a broken heart. We will keep you posted as we pursue all avenues to ensure that this does not happen again. Meanwhile, we want to thank you for your support of this legal action, which secured a TRO to protect Lady that is still in effect, revealed critical information that shed light on what happened to these horses, and uncovered the behind the scenes machinations that allowed this horrific roundup to take place.